Tired of roast potatoes? I am not!! I love roast potatoes, I love potatoes anyway I can get them and never tire of them but spice them up in a delicious coconut adobo sauce and you have got me again!! 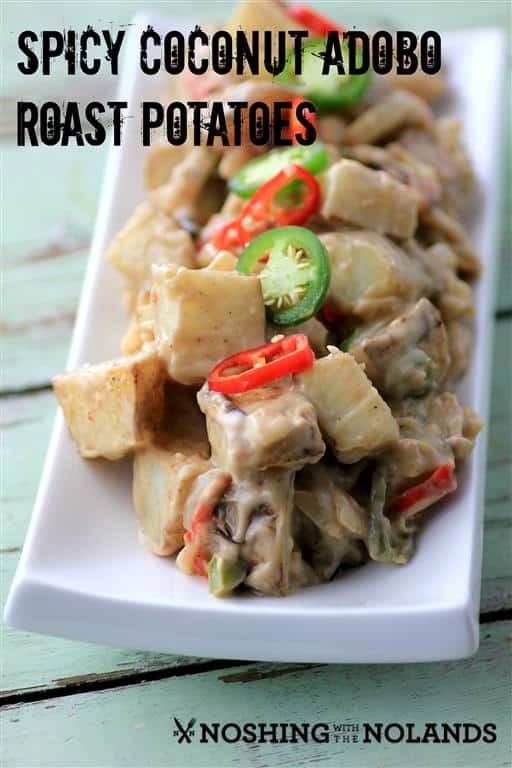 These Spicy Coconut Adobo Roast Potatoes will have you going back for more and more and they are easily made with Pulo Coconut Adobo Cooking Sauce. I created this recipe to make something different, to show you the vast uses for these wonderful sauces. 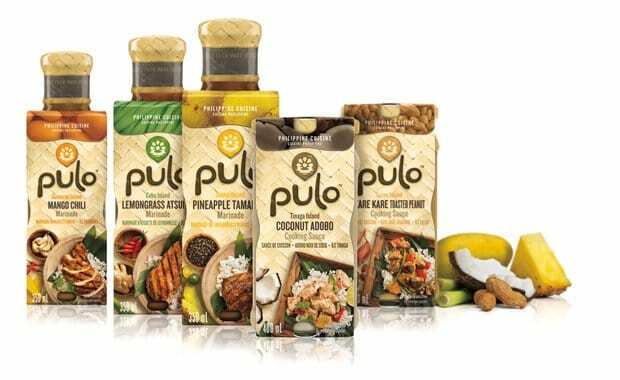 Pulo is an authentic collection of sauces and marinades inspired by the 7000 Islands of the Philippines. The Philippines cuisine is a mixture of cultures from Malaysia, China, Spain and India. Pulo’s sauces contain no artificial flavors, colours, perservatives and are vegan. 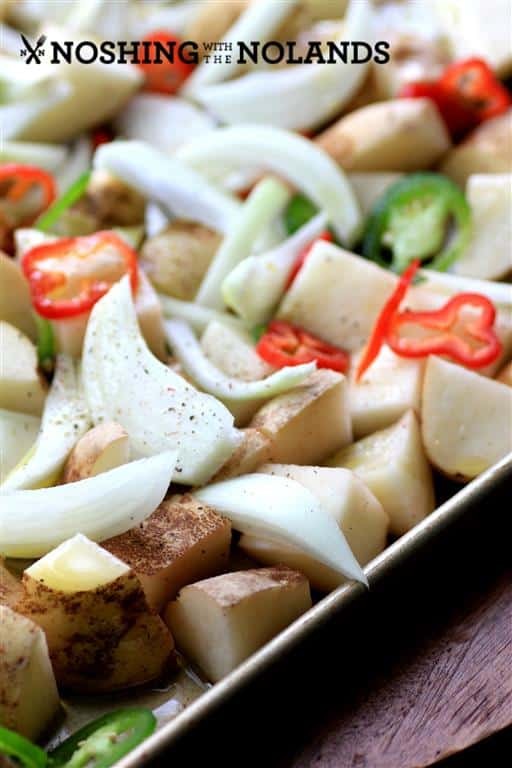 These Spicy Coconut Adobo Roast Potatoes are vegan. Serve them with a lovely salad and you have a great meal on their own. I served this up with a simple pork tenderloin that we marinated in their Pineapple Tamarind Marinade for about 6 hours. We then quickly seared it in a cast iron pan and finished baking it in the oven. Delicious and nothing could be easier. We are loving all the marinades on pork, chicken and steak. Amazing flavor and what could be simpler. I roasted the potatoes first until just done. Stir them often so the jalapenos don’t get too over done, some nice charred bits are good though. 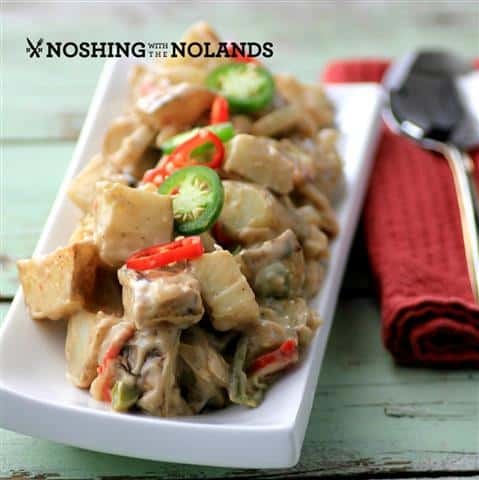 The coconut adobo sauce is a medium spice but we amped it up with a few jalapenos. Not too hot but nice and mouth warming on a cold January day!! 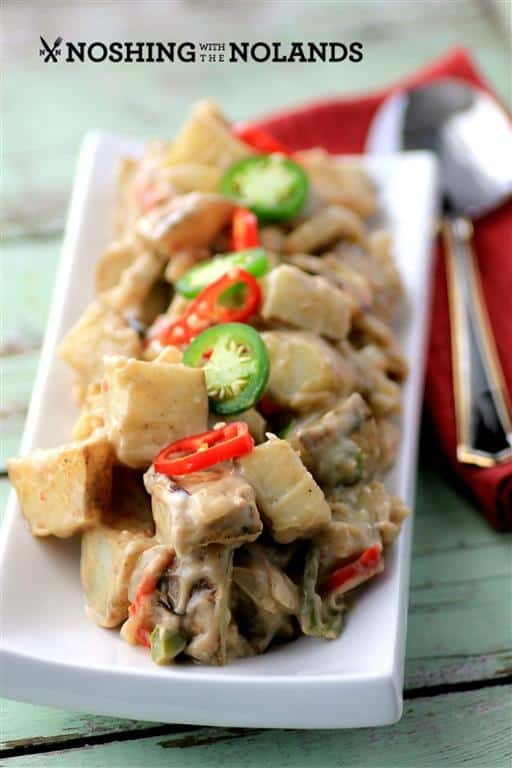 Pulo’s Coconut Adobo sauce is so creamy and bursting with unique flavors. 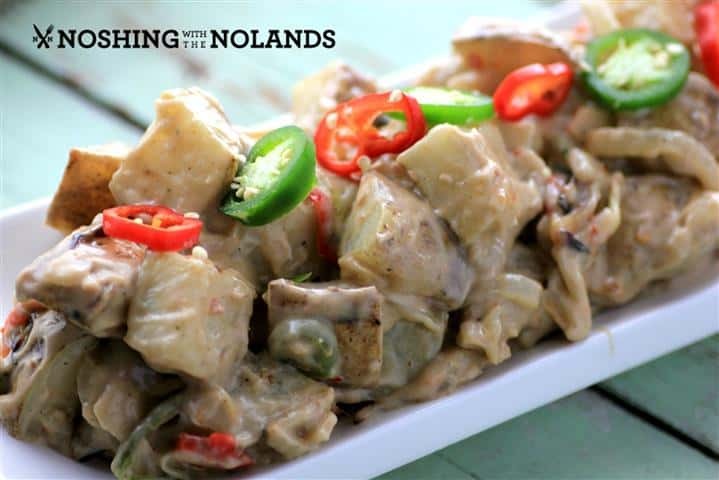 The adobo pairs beautifully with the coconut flavor and the heat of the spices add so much to this dish! Try all of the Pulo sauces, you will fall in love with them like we have!! Pulo can be purchased in Canada at Walmart. ENJOY!! Preheat oven to 425F. Place the potatoes, onion and one of each of the peppers on a rimmed baking sheet. Drizzle with the olive oil and salt and pepper. Roast in the oven for 35- 40 min. Turning frequently so the peppers don't char too much. Once potatoes are fork tender, they don't need to be browned, remove them from the oven. Place them in a large saute pan with the coconut adobo cooking sauce. Heat and stir for about 5 min. Serve immediately topped with fresh jalapenos. Really interesting dish. Nice to sometimes have a really good starter to work with. Thanks so much Peter, it makes a great vegan dish as it is filling on it’s own with a salad on the side! What a great way to dress up roasted potatoes…looks so flavorful and fun to make! Thank you so much Linda, they sure were good! Tired of potatoes? NEVER! This looks REALLY good! I never tire of potatoes either, love them so many way, including this way, thanks Dorothy! Never seen a dish quite like this before.. but I do love anything with potato! Tara, these potatoes look fantastic!!! Mmmm, this sounds fantastic! I love the sound of that sauce. Can’t wait to try this.